For the majority of dog owners, doing a good job of looking after their dog is one of their highest priorities. For anyone who wants to own a Golden Retriever, one of the most loveable and popular breeds of dog, it’s a great idea to go and look for Golden Retriever puppies for adoption. To keep your Golden Retriever, or any breed of dog for that matter, in good shape, you need to take into consideration several factors. To maintain proper health, you need to give your dog nutritious food, take your dog out for daily walks and exercise. You’ll also want to give him good obedience training. Your dog also needs to be properly groomed in order to stay fit and healthy. Grooming isn’t just for good health though, it also keeps your dog looking his best! The different breeds of dogs all have unique grooming needs. Understanding your dog’s requirements is the secret to good grooming. There is a fair bit of difference between grooming, say, a German Shepherd and grooming a Golden Retriever, due to the differences in their coats. Grooming a Golden Retriever is a continuing process. Golden Retriever dogs usually have a good thick coat and are known shedders, while their dense undercoat is water resistant. Their coats shed quit a bit during the year, but are known to shed profusely twice a year. The Golden’s thick coat requires regular brushing and bathing to remove debris and mats. There are certain tips that you can follow for the proper grooming of your much loved Golden Retriever, which will help you to improve your pet’s appearance. Following such tips will help you give your doggy friend a lovely shiny coat and healthy appearance. 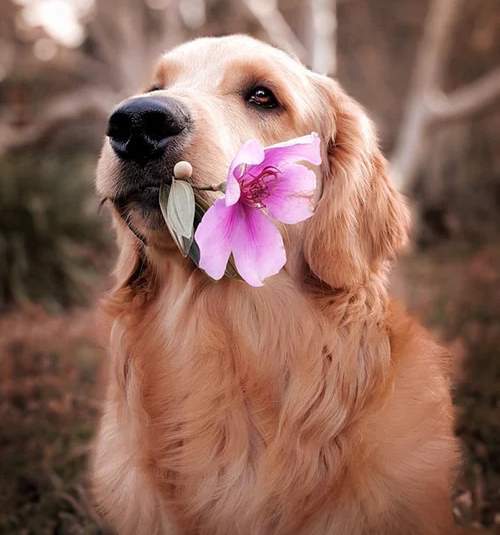 A proper grooming process for your Golden Retriever will include cleaning of the eyes and ears, regular brushing of the coat and cutting nails. We also trim the fur around Bo’s feet and lower legs – what my son calls his “mud flaps”. The whole grooming procedure requires lot of patience and time; but if you love your pet dearly, then devoting an hour – twice weekly – won’t be a difficult task. Brushing your Golden Retriever’s coat regularly is important to remove any loose fur, as well as removing and loosening any trapped dirt. Always use a good quality brush and gently apply it on your dog’s coat. Giving your dog’s coat a quick daily brushing will prevent them from shedding too much on your furniture and around your home. Brushing should begin at the head of the dog, and should be progressed down the dog’s body towards the tail. When grooming, don’t forget to brush the fur under the tail, the back of the legs and around the ears. During the grooming process, take the time to look for any sign of skin irritation or infection, and also be on the lookout for ticks and fleas. It’s important to maintain proper hygiene for your dog in order to avoid skin problems and allergies. To rejuvenate your Golden Retriever, and make his or her coat shine, there’s nothing like a good bath. Use mild hot water when bathing your dog, and use a proper dog shampoo. Regular bathing will prevent the growth of ticks and fleas. Proper bathing sessions will reduce the risk of allergies and will minimize shedding. Bathing also helps to prevent skin infections or minimize their spread, and it removes dirt and fleas. It’s crucial for all loving Golden Retriever owners to take good care of their beloved pets. Proper grooming is highly essential, since it is part of keeping your dog healthy, improves your pet’s appearance and protects it from unwanted diseases.